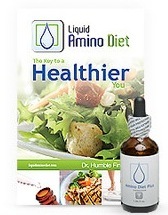 The Liquid Amino Diet plan combines a low glycemic diet with specially formulated “Amino Diet Plus” drops. This program claims to produce rapid weight loss, elimination of abdominal fat and improved metabolism. Dieters are promised weight losses between 15 and 30 pounds in just one month. The Liquid Amino Diet involves the use of “Amino Diet Plus” drops, which contain a combination of homeopathic remedies and amino acids. Creators of the Liquid Amino Diet assert that each ingredient carries out a very specific function that speeds up weight loss. The drops are claimed to increase metabolism, enhance fat-burning and support the functions of the liver, thyroid, and digestive system. Along with taking the liquid amino drops you will follow a low glycemic diet that consists of three phases, with three meals and two snacks each day. Ideally you should eat a large breakfast with each meal becoming gradually smaller throughout the day. Eating after dinner is not permitted because this disrupts your hormones and slows your progress. Before commencing with phase one there is a two-day preparation phase where you eat eggs, dairy, olive oil, avocados and nuts. You also start taking supplements of omega-3 fish oil. Dieters are encouraged to eat some of their favorite foods during this time because they will not be allowed once you commence the diet. Phase 1 is the main weight loss phase of the diet with a 1000 calorie daily allowance. You will commence a low-glycemic diet that includes lean protein, beans, vegetables, fruit and healthy fats and also start using the drops. This phase can last between 30 and 90 days, depending on how much weight you have to lose. If you still want to lose more weight after 90 days you can come back to phase 1 once you have completed phase 2. Phase 2 continues for three weeks and its purpose is to prevent your body going into starvation mode, which could lead to reduced metabolism. You don’t take the drops during this phase. The daily calorie allowance increases to 1500 and more variety is allowed. You can consume small portions of whole-grain bread and oatmeal in addition to the foods in the phase 1 plan. Phase 3 is the final phase where you maintain your weight loss by following a healthy lifestyle. You can gradually increase your intake of sugars and starches while eating the amount of calories that is appropriate for you. The liquid amino drops are only taken during phase 1. However, dieters should take a vitamin supplement, fish oil capsules, and a scoop of protein powder in all three phases. Chicken breast, tilapia, tuna, shrimp, crab, beef, veal, eggs, cottage cheese, non-fat Greek yogurt, protein powder, tofu, black beans, pinto beans, oatmeal, whole grain bread, coconut, avocado, almonds, natural peanut butter, asparagus, spinach, lettuce, cabbage, cauliflower, tomato, apple, strawberries, blueberries, cocoa powder, apple cider vinegar, stevia. Although exercise is encouraged it is not a requirement in order to succeed on this program. On days where you exercise for more than sixty minutes you will need to follow a slightly adjusted diet. A 30-day supply (1 bottle) of Liquid Amino Diet is $97 with discounts offered if you order two bottles or more. Each bottle comes with the “Amino Diet Guidebook”, an oral syringe for accurate measurement, and free email and phone support. See their official website here. High intake of protein and vegetables helps to reduce appetite. Recipes are available on the Liquid Amino Diet website. Dieters have access to health coaches via email and phone. Extremely restrictive and requires the elimination of many foods. Calorie intake is below that recommended for healthy weight loss. Requires time for planning and preparing meals. Many dieters will struggle to maintain weight loss once they reintroduce more foods back into their diet. Drops have not been scientifically tested to support their effectiveness. Requires the use of nutritional supplements – including the drops – which are quite expensive. Are Amino Acids the Secret? The Liquid Amino Diet claims to produce rapid weight loss due to the effects of the drops. However, results achieved on this program are most likely to be related to the severe restriction of calories, rather than any special properties of the drops. Many dieters do achieve fast results on programs like this. However, in most situations the weight is regained when normal eating is resumed.